Ear infections in dogs are very common, and most of the dogs suffer from this condition at least once in their life. You only can help them by taking care of their ears, and you can do that with these 10 best dog ear care products. Your dog will feel immediate relief immediately, with just using this natural ear cleaner. It will remove itch, smell and gunk in only 2-3 days and for healthy condition, it will restore it in seven days. This ear cleaner includes no pharmaceuticals, synthetic chemicals or antibiotics and it is 100% safe to use on your pooch. Manufacturers guarantee that it will work or they will send you your money back. 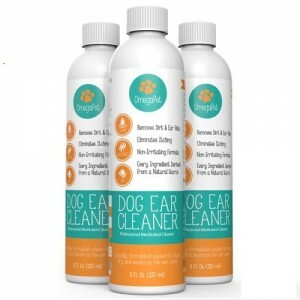 OmegaPet ear cleaner is higher rated than other leading brands and it works by cleaning, drying, acidifying and deodorizing your pet’s ear canal. It has formula with no irritation and since it is gentle and kind, your pet will not mind using it. It works almost instantly and it relief your pooch from pain. Because the formula is concentrated, you just have to use a little bit of this product, and it will work like a charm. This product is meant for treating inflammation of the external ear caused by viral, yeast or bacterial infection. It contains no antibiotics and it destroys antibiotic-resistant organisms. You will need to use it once a day for 7 days for acute infection and once a day for 14 days for chronic infection. And advice is not to use it in conjunction with other topical ear medications or cleaners. You can use this cleanser for dogs, puppies, kittens and cats, and it is a non irritating formula with anti adhesive properties so it will prevent microbial attachment. If your dog has odor in ear canal, this Epi-Otic ear cleanser will eliminate that too. Great thing is that you don’t have to think about the age of your dog or cat; it can be used for any age. Customers only have good words for this product. If you want to prevent ear infection in your dog, then the right way to do that is with ear wipes. This wipes contain natural Aloe Vera and Eucalyptus Oil, so your pet friend will have clean and fresh smelling ears. It is meant to be used daily and it will quickly clean up the mess in your dog’s ear. Wipes are disposable and its regular use will prevent ear infections. 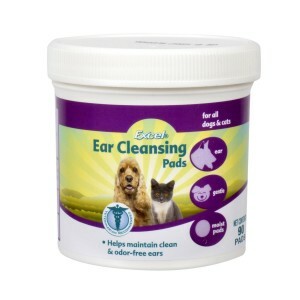 Looking for an effective, non toxic way to clean your dog’s dirty ears? This is a solution for you. Zymox ear cleanser has no harmful and harsh chemicals or cleaners in it and it will leave ears smelling fresh and nice. Bottle has 4-ounce and it is very easy to use. Your dog will have clean, non infective ears, and you will be happy seeing your best friend running around with no worries. One of the best products among these 10 best dog ear care products when comparing price and quality, and your dog will love it. It will prevent infraction by removing ear canal wax and buildup, making it difficult for bacterial or fungal infections to occur without any burning. External ear canal also don’t stand the chance with this TruPet ear cleaner solution. And also, if your dog has odor in his ear, this product will get rid of that too. This product is made with natural pyrethrin insecticide and it helps reducing itching and eliminates ear mites and ticks. It needs to be applied 5 drops into the ears twice a day and repeat treatment until mites and ticks are eliminated. It works like a charm and it is made of Pyrethrins, Pyperonyl Butoxide, Sodium Benzoate, etc. It is really a trustworthy choice. Ear cleansing pads clean and dissolve wax build up. They are non-irritating and have soothing formula. In the packaging are 90 pads so one packet will last you long time. It can be used daily and it will provide gentle cleansing, making your pet’s ears clean and odorless. Easy to use, your dog will love them and cat also. Miracle care presents to us a drying ear cream used to help removing dirt from pet’s ear canal. It reduces waxy build up and cleans your dog’s ears. This packaging has 20g of miraculous powder and you and your pet will simply love it. This product has nothing but good words from its users and customers, and it will keep your pet’s ears dry and odor free. Ear are as important as any other part of the body, and since dogs have lot of problems with their ears, it is important to take good care of them. With these 10 Best Dog Ear care products you can do that your dog won’t suffer anymore.